After the shock reveal of the traditional 3.5mm headphone jack being dropped from the Moto Z and Moto Z Force, it seems Motorola has decided to keep the aging tech for a future Moto Z release. If you're gutted about losing the headphone jack on the Moto Z, the latest leak suggests we will get a Moto Z Play that'll rectify that issue. The Moto Z Play is shown in a leak from HelloMotoHK where it's pictured alongside the Moto Z and Moto Z Force. The Play is quite a bit thicker than the Moto Z, but is still a similar size to the Moto Z Force - thanks to a shatterproof screen and bigger battery - despite sporting a 3.5mm headphone jack. 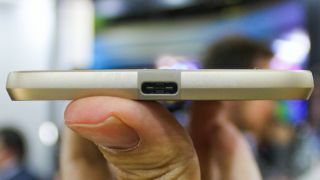 All three phones look to feature USB-C connections as well to give you a faster charging power as well as quick data transfer. If you buy a Moto Z or Moto Z Force, you get a USB-C to headphone jack converter so you can still use your older headphones. Why Motorola has chosen to keep the headphone jack on the Moto Z Play isn't currently clear, but we'll be sure to find out if/when the phone officially launches. Previous spec leaks have suggested the Moto Z Play will come with a 5.5-inch Full HD AMOLED display as well as a Qualcomm Snapdragon 625 chipset and 3GB of RAM. It'll also sport 32GB of internal storage, a 16MP rear camera and Android 6.0.1 Marshmallow software.